[Updated with video] The Immigration Bill will be removed from the House of Assembly’s Order Paper, and the Government will “enable further community input” and Parliament will “consider immigration reforms in stages,” the Premier announced this evening. “Consultative working groups, comprising of key stakeholders, will be set up to discuss the various elements of the Bill and to make recommendations” the Premier said. The Premier said the principles of the original Bill will form the basis of their terms of reference and the working groups are to submit their input to a fixed schedule that will allow Parliament to consider immigration reforms in stages. The first working group will deal with children and family aspects such as children born in Bermuda or who arrived here at a young age, adoption, and maintaining the integrity of mixed status families, and the Premier said it is expected the group will submit recommendations that will enable an amended Bill to be tabled on May 13. “The agreement accepted this afternoon by Mr. Furbert and his colleagues will see us press the re-set button on the immigration reform schedule, setting the stage for wider input into the specific reform proposals,” added Premier Dunkley. Earlier today, I sent a letter to Bermuda Industrial Union president Mr. Chris Furbert outlining a plan to end the impasse that has caused disruption and distress across the Island. The letter was the product of days of constructive dialogue between Government representatives, Mr. Furbert and his union colleagues, as well as input from the wider community. I am happy to report that agreement has been reached on a way forward and that the impasse will end. Members of Parliament will return to work on Monday. Public services will resume, and business activities affected by the withdrawal of labour will return to normal. To achieve this agreement, the Government will enable further community input into the various elements of the Bermuda Immigration and Protection Act. The Bill itself will be removed from the House of Assembly’s Order Paper. Consultative working groups, comprising of key stakeholders, will be set up to discuss the various elements of the Bill and to make recommendations. The principles of the original Bill will form the basis of their terms of reference. The working groups are to submit their input to a fixed schedule that will allow Parliament to consider immigration reforms in stages through the current ‎session to the start of the next one in November. · Maintaining the integrity of mixed status families. It is expected this group will submit recommendations that will enable an amended Bill to be tabled on May 13. A second working group dealing with the grant of Permanent Resident Certificates after 15 years is to submit provisions for debate during Parliament’s summer session. A third group will be formed to submit recommendations on the grant of Bermuda status after 20 years. Its work would be tabled for debate in the November session. The agreement accepted this afternoon by Mr. Furbert and his colleagues will see us press the re-set button on the immigration reform schedule, setting the stage for wider input into the specific reform proposals. This is a good result to emerge from days of disruption. The process to this point has been difficult, but it has also been constructive and enlightening. What has emerged is better community understanding of an issue that is critical to individual lives, our collective future and the meaning of our Island home. What has also emerged is a determination to more closely connect public input with the work of government as it develops. Democracy can sometimes get messy, but there is no better way for communities to work out their problems. The politics is sometimes hard, but it also teaches you that compromise and sacrifice are, more often than not, necessary in order to achieve something for the common good. Over the next few days, we will proceed with the formation of the working groups. Members of Parliament will meet in the House of Assembly to pass the 2016/17 Budget and table legislation that will lead to the creation of jobs. 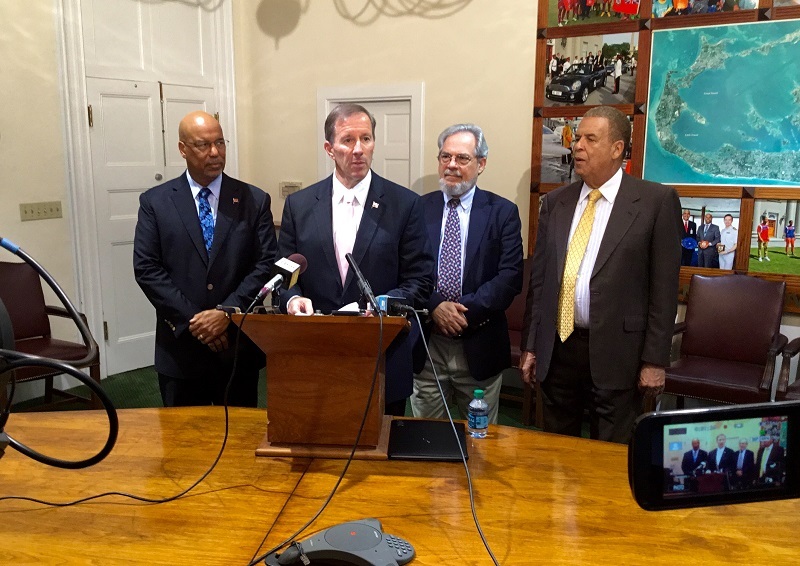 We’re going to get back to the business of the people, working to restore security and prosperity for all Bermudians.